The Green Bay Packers have made changes to their coaching staff that were not limited to just the defense. 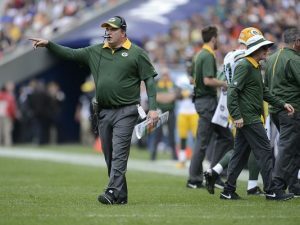 After the team decided to fire Dom Capers its defensive coordinator, Scott McCurley its inside linebacker coach and Mike Trgovac the defensive line coach, the Packers decided to part ways with Edgar Bennett the offensive coordinator and Alex Van Pelt the quarterbacks coach, said sources close to the situation. The contract for Van Belt expired at the end of the regular season and Bennett’s offensive coordinator title was taken away and there was the possibility he could return to take a position coaching job, but that was not expected. The Packers are also looking for a new receivers coach because Luke Getsy has left to become the Mississippi State offensive coordinator. Bennett, a former running back for the Packers, has been part of the coaching staff of the Packers since 2005. He was the running backs coach until 2010 at which time he became the receivers coach through 2014, and then he took over as the team’s offensive coordinator when Joe Philbin joined the Miami Dolphins as their head coach in 2015. However, Bennett did not call offensive plays. That duty has been held by head coach Mike McCarthy since he was hired back in 2006, with the exception of a stretch of 12 games in the 2015 regular season when he handed that off to Tom Clements, his then-associate head coach, who is not with the team any longer. Van Pelt, a former quarterback in the NFL for Buffalo, has been part of the staff under McCarthy dating back to 2012. He was the running backs coach for the first two years he was with Green Bay prior to taking over the quarterbacks. He coached quarterbacks and receivers during 2015. The Packers could go after Philbin and see if he would return to be their offensive coordinator. Philbin was the offense line coach for the Colts last season. Green Bay could also consider Ben McAdoo the former head coach of the Giants, who was part of McCarthy’s staff from 2006 to 2013 at Green Bay. James Campen the coach of the offensive line and the team’s longest-tenured assistant coach with the Packers also is a possibility for the job of offensive coordinator. He is a former player with the Packers and one of the league’s most respected coaches for offensive line and has coached with Green Bay since 2004.